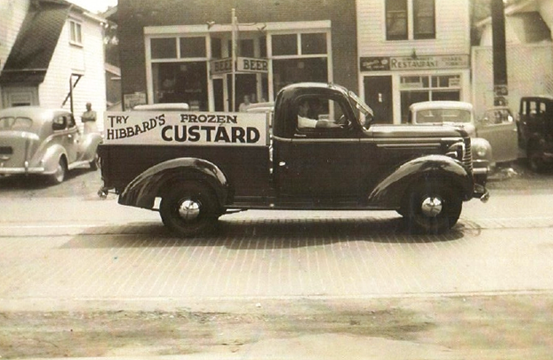 Born in 1902 an entrepreneur Harold Fredrick Hibbard had enjoyed several successful business endeavors before launching his frozen custard business in 1939. In the late 1930’s, while wintering in Florida, a persistent Mr. Hibbard convinced his friend and neighbor (whose family had been operating an ice cream and frozen custard stand since 1902) to share his specialty frozen custard formula with him. To launch his frozen custard business Harold persuaded Chaplin Dairy in Rochester, NY, not far from where the product was invented on Coney Island in 1919, to make the special custard mix for him. Hibbard’s Original Old-Fashioned Frozen Custard opened in April of 1939 in a small 25’ X 25’ building which is where you are standing now. Recently, after doing some extensive research, it was discovered that Hibbard’s Original Frozen Custard is the sixth oldest family-owned, continuously operated frozen custard stand in the United States which still operates from its original location. In the early days, the mix was shipped by train in cars whose only source of refrigeration was insulated jackets which they would wrap around the 10-gallon stainless steel milk cans for the trip to the Suspension Bridge Terminal in Niagara Falls, NY. Harold would then transport the precious cargo via pick-up truck to ice coolers at the stand location in the Village of Lewiston. Our chocolate flavorings were made by the Hershey Chocolate Corporation in Hershey, PA. We have since experimented with several other brands and settled on the Dutch Chocolate syrup that you now enjoy. At one time our cones were produced by the Nabisco Company in Niagara Falls exclusively for Hibbard’s Frozen Custard. Three generations hence and after years of recipe refinement we have what we, as well as many thousands of Western New Yorkers believe, is the best frozen custard available anywhere. Today our custard mix is produced by a dairy farm creamery in the southern tier of WNY and is a special French Vanilla Custard blend made much like our Grandfather Harold’s original “all natural” mix formula made in the 1930s and 1940s, before preservatives were even invented. Our Vanilla flavoring is still made exclusively from a recipe patented by Harold in the early years and is still produced under our exclusive label, “Hibbard’s Special Three Star Essence” which is made from the finest imported large Madagascar Vanilla Bean. From our family to yours, we hope you enjoy our product and we appreciate your business over these many years. In addition, we give you our commitment to continue to produce the finest quality products delivered with the highest quality service in the industry. Serving the Community for 80 Years!!! !